While some criminal offenses are classified as misdemeanors, others are classified as felonies. A person can also be charged with either state or federal felonies, which have some distinct differences. If you end up facing either a federal felony indictment or state felony charges, you should not hesitate to speak with an experienced criminal defense attorney who can make sure that your case resolves in a positive manner. One of the largest differences between state and federal felonies involves jurisdiction. While the federal government prosecutes cases involving individuals who are charged with the commission of federal crimes or federal indictments, states are responsible for prosecuting individuals who are charged with state felonies. Another significant difference between state and federal felonies is that federal felonies are often more serious than offenses charged by state courts. The penalties associated with federal crimes are often more severe than those that a person would receive after being sentenced by state courts. 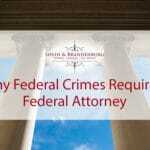 There are numerous other differences between federal and state charges. Some of the other differences between two court systems include which law enforcement agencies (the FBI and other federal agencies for federal offenses, local law enforcement for state police), the prosecuting lawyer (federal lawyers for federal offenses and state attorneys for state offenses), and the length of time that judges serve (for elected periods for state judges, but for life for federal judges). While not particularly common, some people can end up facing prosecution in both federal and state court if they commit an act that violates both state and federal law. Some people ask about how this can happen when the double jeopardy clause is involved. The answer is that while the constitution prohibits individuals from being charged with the same crime twice, there is an exception that allows the state and federal governments to both pursue charges against someone. While this type of dual prosecution is rare, it does occasionally happen. If you are facing federal or state felony charges, it is critical to obtain the assistance of an experienced criminal defense attorney who has helped numerous people respond to these cases and create the strongest defense strategy possible. 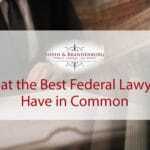 At the Federal Criminal Law Center, we have significant experience in helping clients navigate the court system, which can be particularly complex at times. Contact our law office today to schedule an initial free consultation during which time we will discuss your available options. This entry was posted in Criminal Defense, Federal Crimes, Felonies, State Trials and tagged Federal Crimes, Felony Charge, Georgia State Crime Charges. Bookmark the permalink.